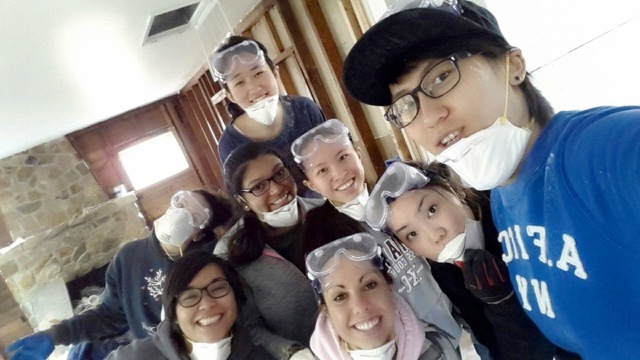 Students with the SU/ESF chapter of Habitat for Humanity gather inside one of the New Jersey homes they helped renovate over spring break in the ongoing recovery efforts after Hurricane Sandy. Steffi Francis ’14 and Denisse Ortiz ’17 planned for the hard work and long days as they painted, cleaned and caulked their way through houses being rebuilt from Hurricane Sandy. They didn’t expect the greatest rewards would be in something less tangible. Francis and Ortiz were part of a contingent of students with the Syracuse University/SUNY College of Environmental Science and Forestry chapter of Habitat for Humanity who spent their spring break on the Jersey Shore, still rebuilding from the 2012 disaster. Another group of students went to Chicago to work on homes. The New Jersey team assisted the Northern Ocean Habitat for Humanity with homes in Brick Township, Toms River and Seaside Heights. Students learned from Lizzie Berardi, the New Jersey chapter’s public relations coordinator and a homeowner affected by the storm, that people in Seaside Heights returned to their homes two weeks after the storm—only to retrieve necessities—and found devastating wind and, worse, water damage that destroyed furnishings and the structure with damp and mold. Funding from the federal government and the work of organizations like Habitat for Humanity have made steady progress on rehabilitating and rebuilding efforts, but much work remains. 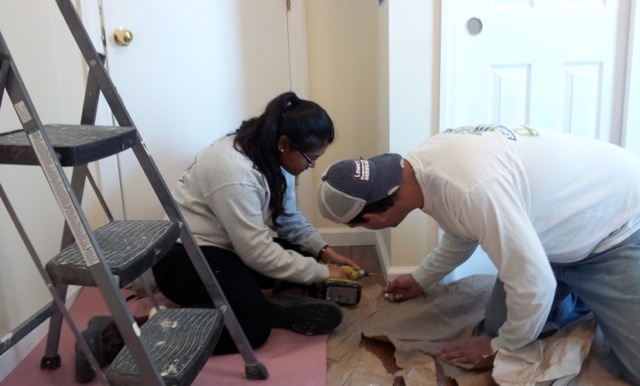 A student works with a construction crew member to help with the detailing at a New Jersey home. Students got a view of the new-build homes that the habitat chapter had worked on. “Northern Habitat’s Director Susan Fichtner and retired engineer Joseph Read proudly gave us a tour of a home that they had built for a family that fell on hard times and explained the somewhat complex process of getting donated or discounted fixtures from big companies,” Francis says. Construction workers Mike Borcina and Leif Myhre also showed students how to install countertops and taught them how to caulk, among other tasks that the students helped with in rehabbing the homes. By the end of that week and the following one, both the Seaside Heights and the Brick Township homeowners were going to be able to return to their homes, Ortiz says. 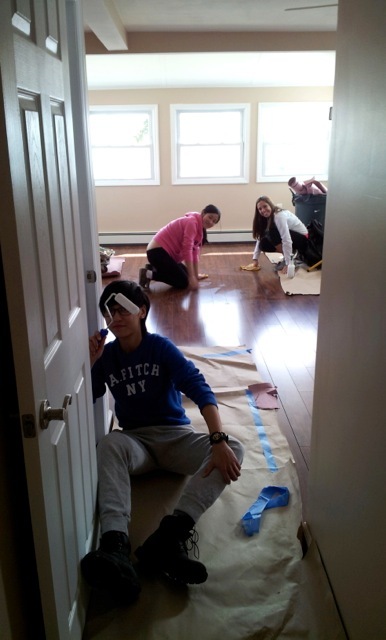 Students finish up painting and cleaning inside a Habitat home before residents move back in. Those are important milestones for those families as they recover—and for the friends, neighbors and strangers from such distant places as Syracuse who want to assist in that recovery. Dawn Parlapiano and her sister contacted Habitat for Humanity on their parents’ behalf and the rebuilding process began.